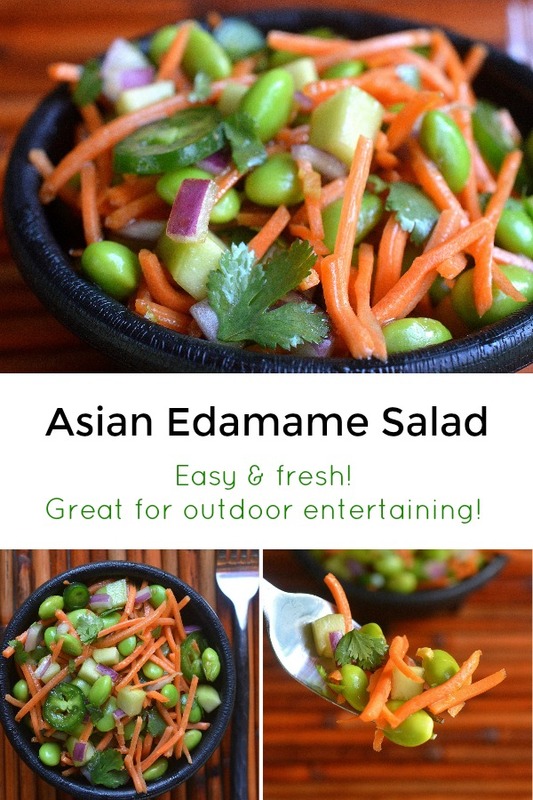 Here’s a simple Asian Edamame Salad that is perfect for a side dish for BBQ’s and gatherings or as a simple lunch. The first time I visited a Corner bakery was a few years ago, and I fell in love with my first order. An Asian Pork Sandwich with a side of Asian Edamame Salad. OMGosh, I think I returned 3 times over the next month just to have it again and again. Sadly, Corner bakery no longer serves that sandwich…le sigh (and funny enough I haven’t been back really since they stopped). 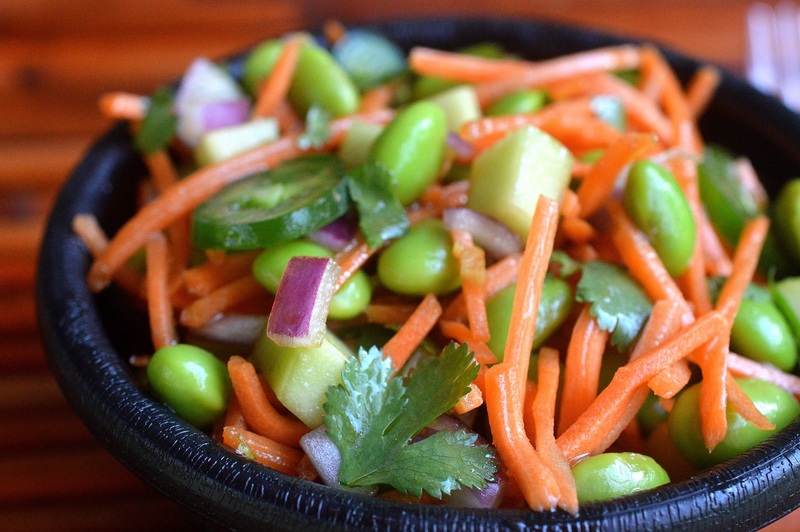 I decided to replicate their Asian Edamame Salad since its so fresh, vibrant and good for you! It’s so easy to make too. The last 5-6 weeks I seem to eat this or a simple Caprese salad every day for lunch. And that fine by me! 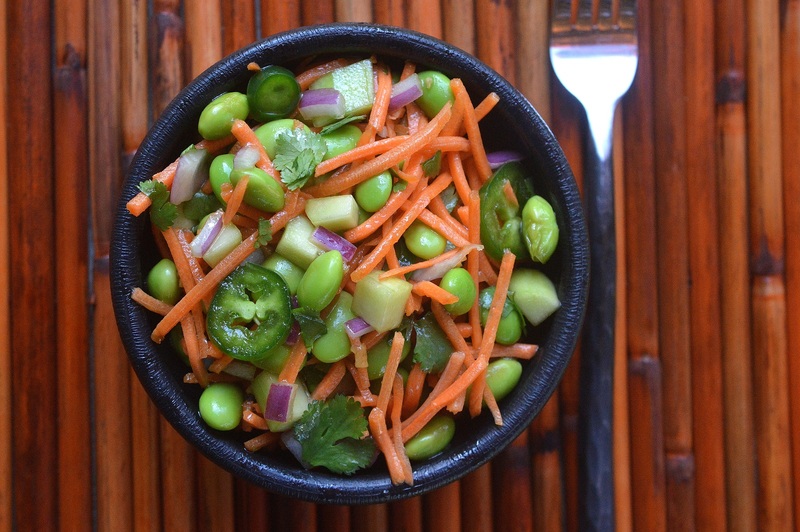 All you need for my version of this salad are shredded carrots, edamame, cucumber, red onion, scallions, cilantro (if you wish). Then make the dressing. Originally this salad had peppers in it (red pepper and orange pepper) however I always picked them out of it, lol! So I substituted cucumbers. I like heat, so I also added a few slices of jalapeno. Sometimes I throw peanuts in, mmm! You can totally customize this as you wish! Add in tomatoes, a cheese you enjoy, jicama…Whatever you want. The simple dressing is scrumptious. I have learned that when I made certain dressings or marinades, I choose garlic paste and ginger paste vs minced. It’s just SO much better and honestly so much easier, no mess and no time…gotta love that! (Gourmet Garden is my go-to for this). 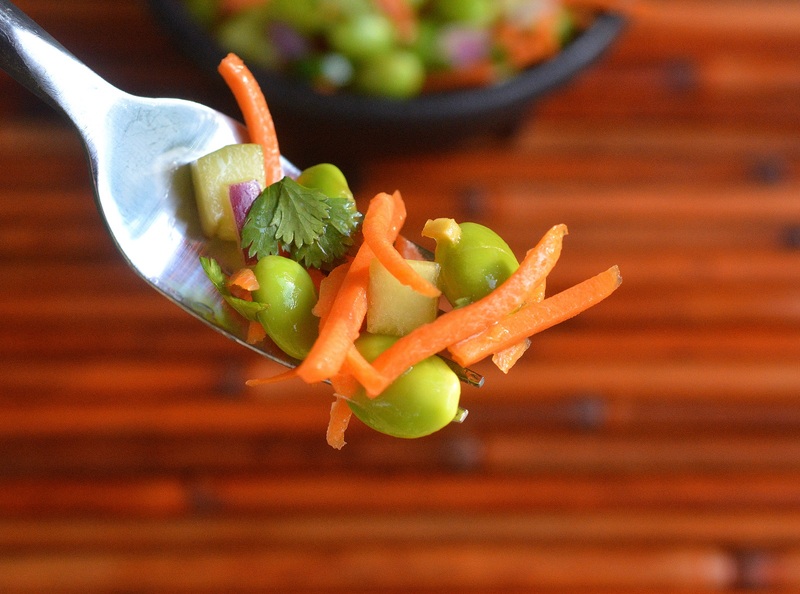 This Asian Edamame Salad is crunchy, refreshing when served chilled and pretty! Bet it would be a hit at your next BBQ! Assemble salad ingredients in a medium bowl, tossing to combine. Combine dressing ingredients in a mason jar and shake until emulsified. taste and adjust for your preference. Pour dressing over salad, toss and enjoy! Feel free to add in peppers, additional vegetables and or herbs or whatever you wish to make this salad your own.